Chromjuwelen Motor Öl: Pre-Order Now! Ladies and Gentlemen, allow me to introduce you to our first Chromjuwelen product: Chromjuwelen Motor Öl — specially formulated for classic cars! Anyone who drives a classic is familiar with the question of which oil is the best one for his engine. Nowadays even the least expensive products are of such high grade that they are superior in quality to the top motor oils of the past. But because most classics are taken out on the road only a few months per year they experience long periods of inactivity. Base motor oils are not made for this; they do not adhere long enough to provide a protective coating on critical parts such as cylinder liners, camshafts and crankshafts and end up flowing back into the oil pan. This makes the next cold start a material killer. Chromjuwelen Motor Öl is custom tailored for classic engines operated only a few months per year. Formulated by Mathé® Classic, the oil provides wear and corrosion protection precisely tailored to the needs of historic engines and ensures long-term adhesion to metallic surfaces. This mitigates potential damage that may ensue following long periods of inactivity such as winter storage or museum exhibitions. Based on a mildly alloyed, mineral-based multigrade oil, Chromjuwelen Motor Öl is ready for immediate use and can be mixed with all standard brand name mineral-based, HC synthetic or synthetic motor oils. According to SAE classification, Chromjuwelen Motor Öl is suitable for vehicles of all types: cars, motorcycles and utility vehicles. 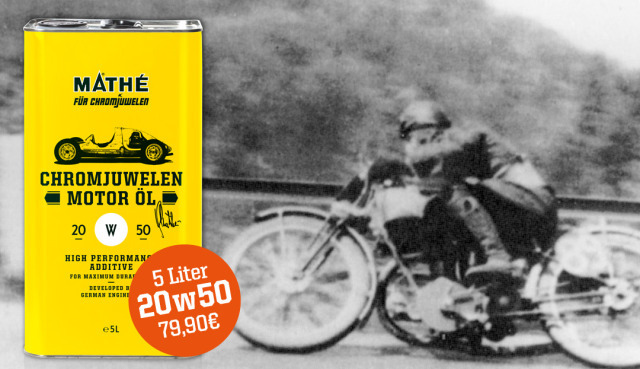 Chromjuwelen Motor Öl is specially formulated for vehicles only used occasionally and tolerates long periods in between use. Order in advance — you’ll be glad you did! The official sales launch is scheduled for September 1, 2012. Chromjuwelen Motor Öl is available for purchase at http://chromjuwelen.com and select outlets. Initially, two viscosities are available: SAE 15W-40 and SAE 20W-50. MVG® Mathé-Schmierstofftechnik GmbH will be handling the shipping. Advance orders will be taken from the beginning of August 2012 – with substantial customer benefits! For the purchase of a 5l canister by September 1 the shipping and handling fee of EUR 5.95 will not be charged for delivery within Germany. The customer will also receive a free one-liter bottle of the selected viscosity at no charge. Ordering 5 liters thus saves the customer EUR 24.85! Delivery starts from September 3, 2012. 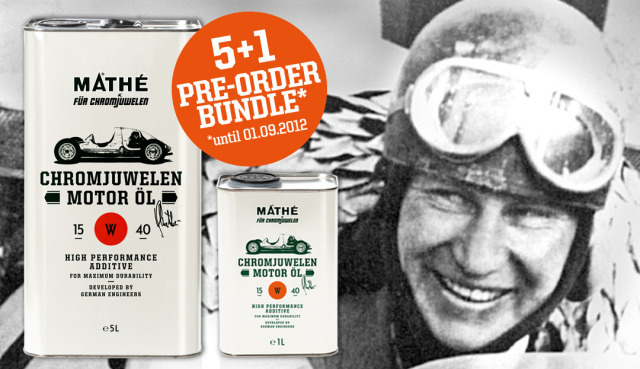 Chromjuwelen Motor Öl: Made by people with a passion for classic cars for people with a passion for classic cars. 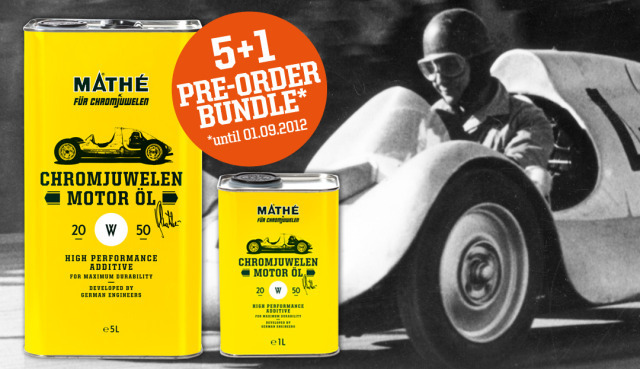 Chromjuwelen Motor Öl was jointly conceived by MVG® Mathé-Schmierstofftechnik GmbH and Chromjuwelen, is based on the needs of the various groups of classic car aficionados, and its premium standard of excellence and formulation with Mathé® Classic make it unique. Chromjuwelen Motor Öl is manufactured by MVG® Mathé-Schmierstofftechnik GmbH in Soltau, Germany. The additive specialists can look back on a long tradition. Since the mid-80’s they have been carrying on the legacy of racing legend Otto Mathé. To improve the performance and lubrication of his motor oil, Mathé developed his own additive. This resulted in his engines running more reliably than the same types of engines being used by his competitors. Whether in his "Ahnherrn", the Berlin-Rome car developed by Ferdinand Porsche, a Porsche 356 or his "Fetzenflieger" (scroll to 1952) adorning the Chromjuwelen Motor Öl logo, Otto Mathé (1907-1995) was a legend in his own lifetime and dominated racing in Austria. Although he steered using only one arm (his right arm was paralyzed in an accident), he went from one victory to another. Niki Lauda still says that "Otto Mathé was the idol of my childhood". The oil was named after Chromjuwelen ("chrome jewels"), the magazine for motor culture, since 2005 publishing issues related to classic vehicles at http://chromjuwelen.com. Like practically no other medium it is familiar with the needs of the individual car cultures, including everyday classics, exclusive unique specimens and high performance vehicles from international car racing. Chromjuwelen.com is a reference frequently quoted beyond the borders of German-speaking countries, especially when the topic is "Motorkultur".